There is speculation in the auto and tech industries that Apple may be building an electric vehicle, but shhh we aren’t supposed to know anything – it’s top secret. In this day and age it’s hard to believe anything is “top secret,” but companies will tout it just to get more coverage. It’s a smart marketing maneuver and gets the consumer’s attention. But I digress. Let’s continue back to Apple. Apple is actively recruiting automobile industry experts to work at a secret lab. The hires reportedly include vehicle design experts. The Apple research lab was set up late last year, not long after Apple unveiled its forthcoming smart watch and latest iPhones, which suggest that any resulting product may still be years away from release. Apple often investigates a wide range of new product areas, some of which never get released. Dozens of Apple employees, led by experienced managers from its iPhone unit, are researching automotive products at a confidential Silicon Valley location outside the company’s Cupertino campus. Recent recruits to Apple’s team include the head of Mercedes-Benz’s Silicon Valley Research and Development unit. The word on the street is the codename, “Titan.” But that’s no surprise, as pretty much every pre-released piece of technology or video game is codenamed Titan. Apple figures since Google is working on their autonomous vehicle, why shouldn’t they join in on the fun? I’m not saying Apple’s vehicle is autonomous, nor are we a hundred percent certain it’s even electric. All we know is they are exploring beyond their CarPlay capability (Apple’s infotainment system). CarPlay (auto OS) is a key technology platform for the company in the future. CarPlay is expected to be included in some future Ferrari, Daimler, Volvo, and Volkswagen models. 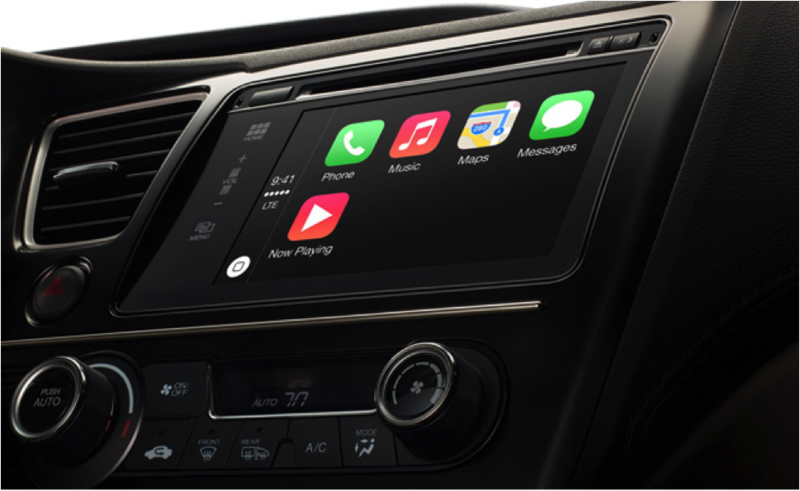 The technology allows iPhone services including Siri, Maps and iTunes music to be controlled through an in-car touchscreen. But the software runs within carmakers’ existing infotainment systems, leaving open the opportunity for Apple technology to be more deeply integrated into vehicles. Electric vehicles have grown in popularity – a big thanks to Elon Musk’s Tesla. Between gamers, car enthusiasts, and tech geeks, the Tesla is an icon in the auto industry. Apple knows this and understands they may have a large enough market to make an electric vehicle worth their while. Apple isn’t the only tech giant dabbling in the auto sector; Google has ambitious self-driving car and Android integration projects of its own. Of course, it will take several years for an Apple prototype, but between then and now I’m sure there will be more information released on their vehicle. In the meantime, we’ll just stare at our computer screens waiting patiently for the smallest bit of new info.